How Come My Tree Bark Is Falling Off? Is your tree bark falling off? Now that we’re reaching the tail end of October, you can definitely begin to tell it’s autumn. Well, one should hope, at least. Despite unseasonably warm temperatures, the leaves are falling off your trees, and it’s more than likely they’re not alone. Is your tree bark falling off? If so, why might that be? What Causes Tree Bark Shedding? First Frost: Now that the weather is starting to cool off, you can smell winter on the distant horizon. After the first frost of the new cold season, some bark will start falling off. You’ll notice that the bark only falls on certain sides of the tree – particularly the south or southwest face of the tree. Rapid changes in temperature can also stress the tree out. Heat Damage: Much like people and pets, trees can suffer heat stroke. Heat damage, much like frost, can expose the tree bark down to the core of the tree. Sick Tree: It’s also possible that your tree is sick, and that’s why its bark is sloughing off. Does This Mean My Tree is Dying? Unfortunately, there’s no straight answer to this question. Again, if your tree looks healthy, you don’t need to worry. It could just be growing pains. But if the weather has hurt your tree in some way, you might have to save it. Inspect your tree for signs of disease or pest infestation. 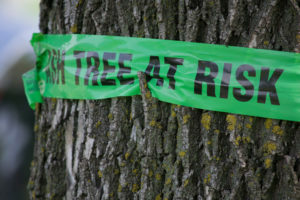 Just in case these conditions exist, you’ll need to call on your tree care experts at Nelson Tree Specialist! This entry was posted on Friday, October 20th, 2017 at 1:49 pm. Both comments and pings are currently closed.